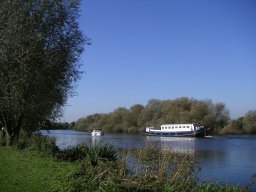 It surprises some to learn that Earley extends as far as the Thames (see map in the Earley Town Guide). You may need to use your car to get to the Thames Valley Business Park. To reach the start point, you can either join the A329M at Loddon Bridge roundabout which takes you straight through, or go via Pitts Lane, left at Shepherd's Hill roundabout onto London Road, straight over next roundabout and then follow signs for the Thames Valley Waterside Centre. You can park at the Centre, cross the grassed area and turn right to walk along the riverbank (Sonning direction). Alternatively, if you park on the dual carriageway just past the waterside centre, and near the Oracle business centre, (not to be confused with the shopping centre! 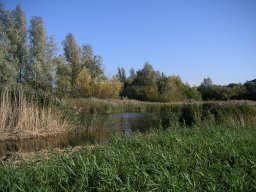 ), take the grassy path which leads to the river. 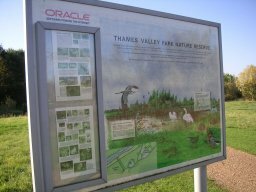 Again, turn right for Sonning and you will eventually come to the Thames Valley Nature Reserve, which has several small lakes. There are various paths through the Reserve, or you can choose to walk on to the lock (and pub) at Sonning. Thanks again to Sheila Crowson for the description and photos.